This is a charming medieval silver-gilt ring-brooch, dating to the 13th - 14th century AD. Ring-brooches are the most common type medieval brooch to survive and had a practical function: to fasten tunics, especially at the neck. 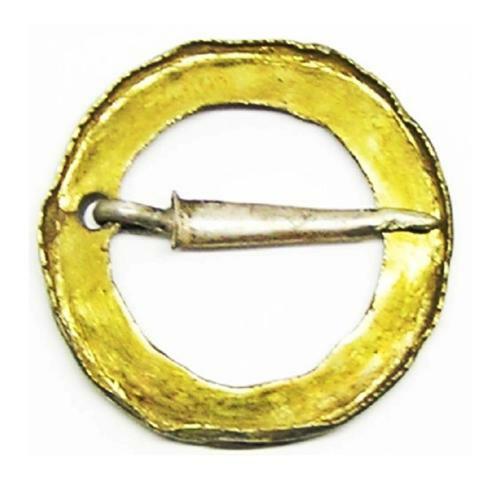 Shaped as rings, with a long central pin, these brooches varied enormously in size and could be tiny, smaller than a fingernail. Ring-brooches were made of costly gold or silver, or of much cheaper copper or pewter. They were worn mostly until the late fourteenth century when changing fashions in dress included more closely tailored clothes and the growing use of button fastenings. This example is rather simple having a fully mercurial gold gilded face, with a raised pie-crust border. This type of brooch would have had a separate openwork plate, fitted to the front (similar to SUR-664262 and SUSS-9A73C2) the sword-shaped pin being left without gilding to the front, to give a contrast in color. The back of the pin and brooch having a light mercurial gold gilt, partly worn through use. A nice piece of medieval jewelry, that can still be worn again today. PROVENANCE: Ex. Cambridgeshire Collection acquired at a Coin Fair 1990's.